Just yesterday the first teaser for Machete Kills arrived, showing the return of Danny Trejo (who turns 70 next year, if you can believe that). 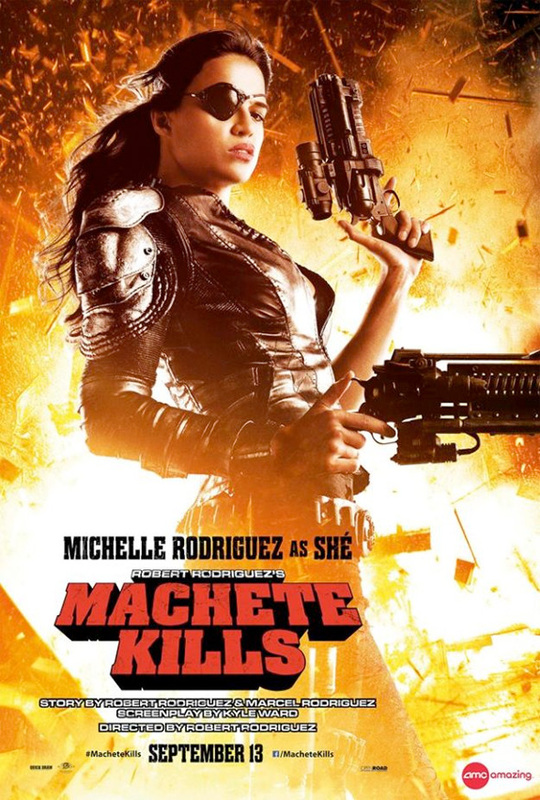 Now Michelle Rodriguez takes the spotlight in a new character poster featuring her character Shé. With guns drawn, a whole leather ensemble and an eye patch, she looks ready to face any number of bad guys alongside Machete. If the trailer is any indicator, this should be another nonsensical, grindhouse inspired romp of violence and blood. Plus, we can't wait to see what Mel Gibson does in the film as the main villain, and how Sofia Vergara's special guns come into play. Look! Same aesthetic as the old ones, nothing new. Still look forward to the film. Shé, instead of Ché... OMG!! SO CLEVER!!! Machete BETTER be good this time!!!!!! Robert has all the good actors/actressess that he needs so this better not flop.